During the week days it is not possible for visitors to go into the church, consequently the model, sales table etc. have been moved into the tower. On Saturdays & Sundays the church is open for worship and, of course, for visitors. 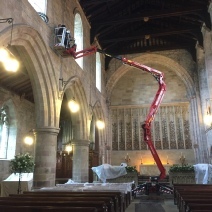 James Pearson has provided some photos of the installation of the new lighting and the tower entrance to the church. Holy Communion was celebrated today, Wednesday 6 April, in the Boyle Room. This will take place every Wednesday for the next 12 weeks while the Priory Church is having new lighting installed. Weekend services will be in the Priory Church as usual. The daffodils beside the church are in full bloom and look magnificent.